Everything was in place for the Washington State football team to fail – and fail miserably – Saturday afternoon at Martin Stadium. WSU fans had seen it all before. An early deficit. A mind-numbing turnover. Tackling that would embarrass a junior high school team. A nonexistent running game. Special teams that were often special in name only. The Cougars have wilted in the face of far less adversity so many times over the past 12 years. This season, however, the Cougars are better. They’re better physically, and every bit as importantly, they are better mentally. Final score: Washington State 38, Arizona State 24. The Cougars, picked to finish in the nether regions of the Pac-12 Conference’s North Division, are now bowl eligible at 6-3 and hanging onto second place behind Stanford. The Sun Devils, ranked 15th in the nation at the start of the season, are 4-5 and in danger of staying home during bowl season. True, there are worst places to spend the winter than Tempe, Ariz. Pullman is rather chilly come bowl season, but that’s only one reason why the Cougars are looking forward to playing in just their second bowl game since 2003. “We don’t want to be satisfied just because we’re bowl eligible,” wide receiver Gabe Marks said. “We have a chance to be the best team in the country,” offensive lineman Gunnar Eklund said. Uh, easy, big fella. Clemson, Alabama, Ohio State, et al are not quaking in their boots over the prospect of playing the Cougars. Still, it’s the newfound confidence and grit of players like Eklund that has Washington State fans believing in their football team in a way not seen in these parts in more than a decade. The Cougars have sold out two of the past three games, and one win in the remaining three regular season games guarantees the Cougars their first winning season since 2003. Technically, the Cougars also need one more win to be guaranteed a second bowl game in three years. That’s little more than a formality once a Pac-12 team wins six games, since a record 80 of the 127 Football Bowl Subdivision teams will play in bowls this season. Washington State has been drawing attention from bowl representatives for weeks. Despite being hidden away in the Palouse, the Cougars offer national appeal with colorful coach Mike Leach overseeing one of the most explosive passing attacks in the nation. On Saturday, Luke Falk overcame an ugly interception early in the game to pass for 497 yards and five touchdowns. The defense overcame a horrific start to make any number of big plays. Special teams had their share of bright spots, and the Cougars took advantage of some amazing good fortune when an inadvertent whistle gave them a “second” fourth down after Marks was stopped short on a pass play with 5 1-2 minutes left in the second quarter. Falk immediately delivered a TD pass. Afterwards, referee Mark Duddy identified the offending party as the line judge, listed as Rich Troyer in the official stats book. WSU fans might want to add Troyer to their Christmas list, since the Cougars were trailing 14-3 at the time. 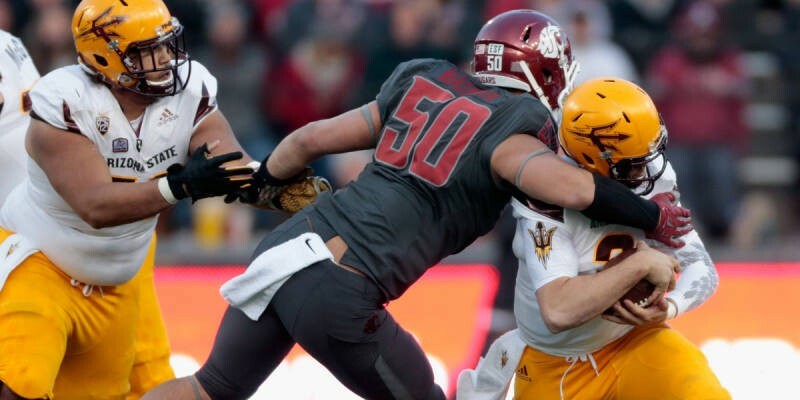 A WSU team that has occasionally struggled in the second half outscored ASU – a strong second-half team – 21-3 in the fourth quarter. Also, the Cougars gave up just three sacks against the blitz-happy Sun Devils while playing with a shuffled offensive line that was missing star left tackle Joe Dahl. Leach never says jack about absent players, so fans are left to wonder if Dahl is injured, ill, dealing with a family emergency, etc. Perhaps Dahl is heading up the Pac-12 investigation Leach has suggested may be in order in response to suspicions that Arizona State may be illegally taping opponents’ sideline signals. Not that Leach seemed overly concerned about sign stealing after Saturday’s win. Twelve long, hard years removed from their last winning season, WSU fans will take their wins any way they can get ‘em.